Normally I stay out of this kind of stuff but I somehow found a horrible breeder who breeds her BLACK and TAN boxer (coloring looks like a Rottie or a Berner) with her White/checked boxer. She is trying to get unique coloration. I know there are tons of bad ones out there but this takes the cake. I don't have the energy to write her an "educational" email. BUT...this just pisses me off. Are we allowed to post breeders websites on here? Ughh...I hate to see that. In my area there is one that posts on a local classifieds site using her white boxer as the dam and a very scrawny fawn as the sire. I don't know if you can post the site, but doing so would increase traffic to her site as well. Do not like the way they look at all. I have never seen a boxer that color before. WTH? ooh yuck. What is that?? O...m...g! I really have no words! Rio is a gorgeous boy with VERY uniquely coloring. He is a Pure Breed Black and Tan Boxer! Black/tan boxers are very unusual and I have not seen very many dogs of this color in the boxer breed so when I saw him advertised it was love at first sight and I snatched him up as fast as I could. I....am.....speechless.... ...I am sorry, but that dog(black/tan)is pretty darn ugly. I have actually seen a boxer ( cough) with those colors at my vets office . The woman was bragging about how beautiful and rare the markings were . When another client said something about Remy's color I did say there were only 2 recognized colors fawn & brindle and sometimes you get white . But never the color of the other boxer , it has to have some other breed mixed in there somewhere . I'm sorta surprised actually, can't see the body at all but the head resembles a boxer shape more than some boxers -how did they keep it when they obviously mixed in other breeds?? 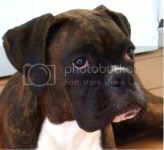 Ps... did you see this page http://keefercockers-boxers.weebly.com/gentlemen.html he's a pure bred! !